Russian chemist, the youngest of a family of seventeen, born at Tobolsk, Siberia, on the 8th of February (New Style) 1834. 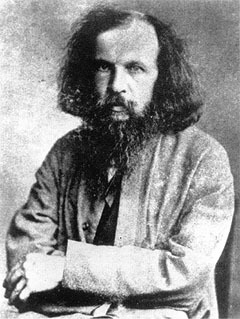 After attending the gymnasium of his native place, he went to study natural science at St. Petersburg, where he graduated in chemistry in 1856, subsequently becoming privatdozent. In 1860 he went to Heidelberg, where he started a laboratory of his own, but returning to St. Petersburg in 1861, he became professor of chemistry in the technological institute there in 1863, and three years later succeeded to the same chair in the university. In 1890 he resigned the professorship, and in 1893 he was appointed director of the Bureau of Weights and Measures, a post which he occupied until his death. Mendeleev's original work covered a wide range, from questions in applied chemistry to the most general problems of chemical and physical theory. His name is best known for his work on the Periodic Law. Various chemists had traced numerical sequences among the atomic weights of some of the elements and noted connections between them and the properties of the different substances; but it was left to him to give a full expression to the generalization, and to treat it not merely as a system of classifying the elements according to certain observed facts, but as a "law of nature" which could be relied upon to predict new facts and to disclose errors in what were supposed to be old facts. Thus in 1871 he was led by certain gaps in his tables to assert the existence of three new elements so far unknown to the chemist, and to assign them definite properties. These three he called ekaboron, ekaaluminium, and ekasilicon; and his prophecy was completely vindicated within fifteen years by the discovery of gallium in 1871, scandium in 1879, and germanium in 1886. Again, in several cases he ventured to question the correctness of the "accepted atomic weights", on the ground that they did not correspond with the Periodic Law, and here also he was justified by subsequent investigation. In 1902, in an attempt at a chemical conception of the ether, he put forward the hypothesis that there are in existence two elements of smaller atomic weight than hydrogen, and that the lighter of these is a chemically inert, exceedingly mobile, all-penetrating and all-pervading gas, which constitutes the "aether." Mendeleev also devoted much study to the nature of such "indefinite" compounds as solutions, which he looked upon as homogeneous liquid systems of unstable dissociating compounds of the solvent with the substance dissolved, holding the opinion that they are merely an instance of ordinary definite or atomic compounds, subject to John Dalton's laws. In another department of physical chemistry he investigated the expansion of liquids with heat, and devised a formula for its expression similar to Gay-Lussac's law of the uniformity of the expansion of gases, while so far back as 1861 he anticipated T. Andrews's conception of the critical temperature of gases by defining the absolute boiling-point of a substance as the temperature at which cohesion and heat of vaporization become equal to zero and the liquid changes to vapor, irrespective of the pressure and volume. Mendeleev wrote largely on chemical topics, his most widely known book probably being The Principles of Chemistry, which was written in 1868-70, and has gone through many subsequent editions in various languages. For his work on the Periodic Law he was awarded in 1882, at the same time as L. Meyer, the Davy medal of the Royal Society, and in 1905 he received its Copley medal. He died at St. Petersburg on the 2nd of February 1907.